There is nothing better than having your main dish and side dish done in one pan. 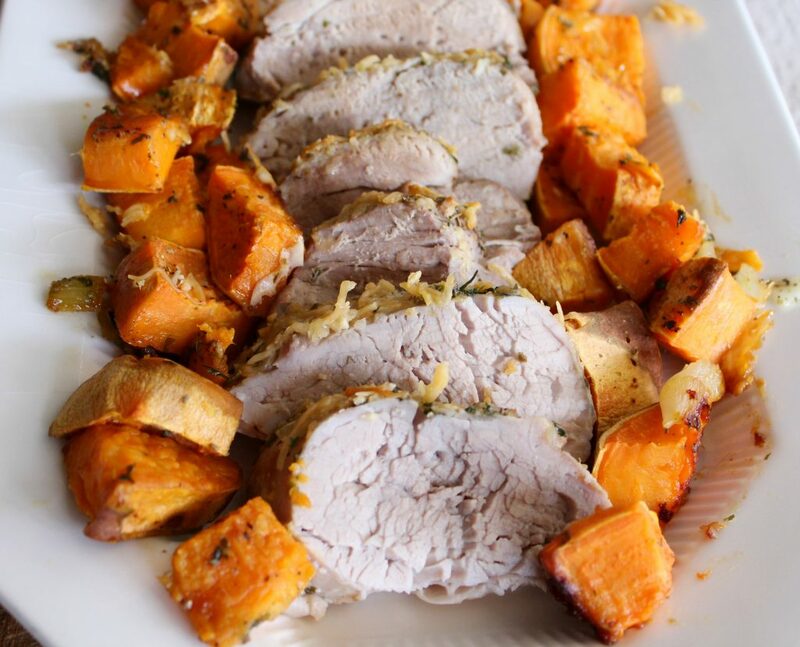 The taste of this Italian Pork Roast goes perfect with the sweet potatoes, we can’t get enough of it! Your side dish and main dish are cooked in the same pan, making this meal a breeze! Peel and slice sweet potatoes and onions and spread evenly in foil lined 9 x 13 inch pan. Drizzle 1/2 tablespoon olive oil, 1 teaspoon Italian seasoning, 1 teaspoon dried parsley flakes, salt, and pepper over the potatoes. After the sweet potatoes and onions have roasted for 10 minutes, push them evenly to both sides of the pan. Place the pork loin in the middle. In a small bowl, mix together the remaining olive oil, Italian seasoning, parsley flakes from the sweet potato mixture, and add in the minced garlic and Parmesan cheese. Brush the mixture over the pork loin, coating it evenly. Roast uncovered for 30 minutes, or until inside is no longer pink. Slice roast and serve with sweet potatoes and onions on the side.